Northern Pass is a proposal to run 192 miles of new power lines from Canada, through northern New Hampshire, south to Concord, and then eastward to Deerfield. The project is a collaboration between Eversource (previously known as Public Service of New Hampshire) and Hydro-Quebec, which is owned by the provincial government of Quebec. The utilities say the $1.6 billion Northern Pass project would transport 1,090 megawatts of electricity from Quebec – which derives more than 90 percent of its power from hydroelectric dams – to the New England power grid. The project has generated considerable controversy from the beginning. Despite its statewide impacts, many of the projects most dedicated opponents come from the sparsely-populated and heavily forested North Country. Eversource says the new lines would bring jobs and tax revenue to this struggling part of the state. But opponents of the project say it would mean only temporary jobs for residents when it's under construction. They also say it will deface New Hampshire's forestland, hurting tourism and lowering property values. Depending on the location, developers say the project's towers will range from 85 to 135 feet tall. Polls have consistently found the public remains sharply divided on this issue. Some critics have pushed for the entire project to be buried. Politicians ranging from Sen. Maggie Hassan to former Sen. Kelly Ayotte to 2012 GOP presidential candidate Newt Gingrich have floated this move as having the potential to soften opposition. Eversource maintains this would be too expensive, and would effectively make the project impossible to pursue. Northern Pass has considered a number of routes for the project, but has publicly announced three. The first, unveiled in 2011, faced major backlash from North Country residents and environmental groups. Over the next couple of years, the project and its primary opponent the Society for the Protection of New Hampshire Forests played a prolonged chess match over parcels of North Country land. Northern Pass ultimately spent more than $40 million purchasing acres of undeveloped land in the North Country. Meanwhile, the Forest Society undertook an aggressive fundraising campaign and sought a slew of conservation easements to block potential routes. This maneuvering narrowed the options for Northern Pass. One lingering possibility was exercising eminent domain. Northern Pass publicly stated it was not interested in pursuing eminent domain. But in 2012, in response to strong statewide opposition, the Legislature closed the option altogether, outlawing the practice except in cases where a new transmission line was needed to maintain the reliability of the electric system. 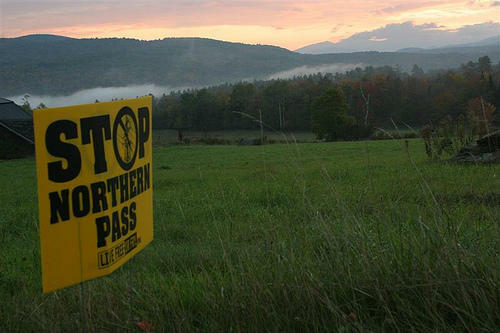 By the spring of 2013, Northern Pass opponents believed the project was essentially "cornered" into trying to route the power line through a large conservation easement, called the Connecticut Lakes Headwaters. The governor at that time, Democrat Maggie Hassan, said she opposed such a move on the part of Northern Pass. 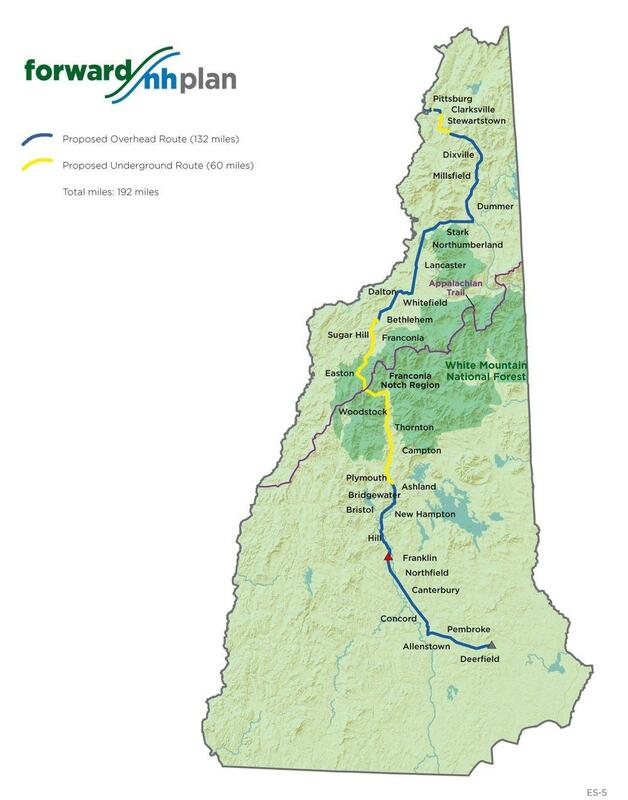 In June of 2013, Northern Pass unveiled its second proposed route. Abandoning its previous strategy (and $40 million in land purchases) altogether, the project proposed building along existing state and local North Country roadways in Clarksville and Stewartstown. In a nod to project opponents, Northern Pass also said it will bury 7.5 miles of line in Stewartstown, Clarksville, and under the Connecticut River. That raised the price tag on the project from $1.2 billion as initially proposed to about $1.4 billion. While opponents said this move was progress, many – including the Forest Society – maintained that Northern Pass should be able to bury all 180 miles of power lines. After years of continued opposition, Northern Pass made its final concession to critics. It downsized the powerline from an initial proposal of 1,200 megawatts to 1,090 to take advantage of a new technology, known as HVDC lite. This move made it more economical to bury portions of the line, and Eversource said it was now willing to bury 52 additional miles of the project. The new route would be alongside state roadways as the project passed through the White Mountain National Forest. While the governor called the change “an important improvement,” she also said “further improvements” to the project should be made. The partial burial did not placate the project’s fiercest opponents, but some speculated that it would help the project clear one significant hurdle: whether it would get approval to use public lands from the top official at the White Mountain National Forest. The move pushed the estimated price tag up again, to $1.6 billion, now for a project that would deliver less power. With its new route in hand, project officials filed to build the project in October of 2015. The application to state officials was likely the longest and most complicated in the state’s history, and 161 individuals, interest groups, and municipalities asked to be allowed to participate in the process to evaluate the merits of the project. Given the size and complexity of the project, many of the interveners pushed for a longer review than the standard one year that state law dictates. In May of 2016, those groups got their wish, and the decision was pushed back 9 months. The final deadline was set for September of 2017. However, once the proceeding got under way, it was clear that even this delay would not allow time to hear from all of the witnesses called by the various interveners. Early in September of 2017 it was delayed again, with a final decision set for the end of February 2018. The New Hampshire Supreme Court has set oral arguments in the fight over the Northern Pass transmission line for this May. Eversource is appealing regulators’ denial last year of the Northern Pass project -- a 200-mile power line that would bring Canadian hydropower through the White Mountains to New England. The case goes before the state’s highest court on May 15. State regulators are in final talks about whether to approve a new transmission line on the Seacoast. After two days of deliberations, the Site Evaluation Committee has agreed that the Seacoast Reliability Project meets some of the criteria required by state law. The New Hampshire Supreme Court has accepted Eversource’s appeal of the state’s rejection of its Northern Pass project. The court has not yet scheduled the oral argument. Several groups are asking the state Supreme Court to uphold regulators' denial of the Northern Pass project. Towns and nonprofits that oppose the transmission line proposal filed their motions with the high court Thursday. The long-awaited appeal argues that the state Site Evaluation Committee, or SEC, broke its own rules in how it judged Northern Pass. 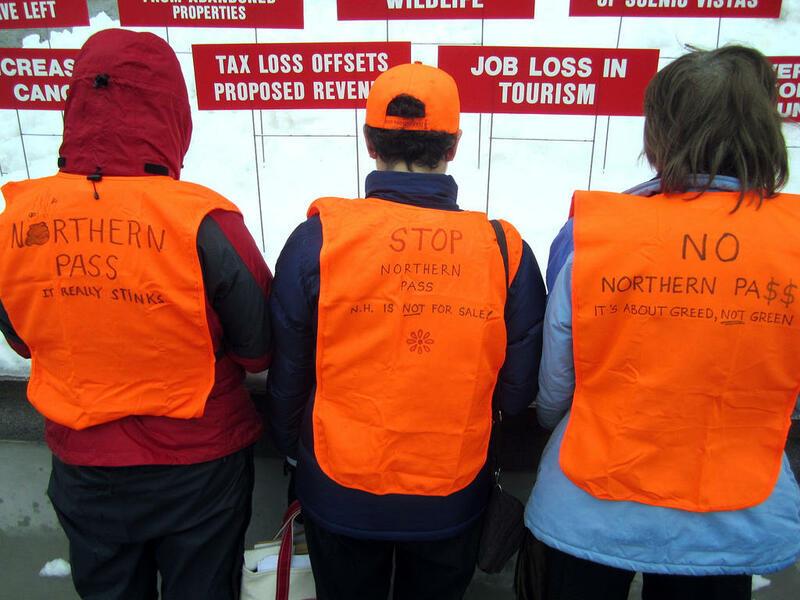 A New Hampshire museum is looking to collect Northern Pass-related hats, T-shirts, videos, and other items to educate future generations about grassroots opposition to the energy project. The Caledonian Record reports the Sugar Hill Historical Museum wants the items for its "Northern Pass Opposition Archives." Project opponent Susan Schibanoff, of Easton, thought of the archives as she researched Easton's 1970s battle against the ultimately defeated proposal for a four-lane highway through Franconia Notch and said she found little on it. While the Trump administration is working to prop up coal-fired power plants, many states are on the hunt for renewable energy. In New England, though, a plan by Massachusetts to tap into Canada's vast, low-polluting hydroelectric dam system is drawing fire. New Hampshire's largest utility hopes regulators will revisit two big energy proposals – one dealing with natural gas and the other with Northern Pass – in the wake of a recent state Supreme Court decision. The utility's filings this week seek to revive two 2016 cases where the Public Utilities Commission applied a view of the state law restructuring the electric industry that the Supreme Court overturned in May. We dig into the results of the legislative session as it winds up, and tally up Governor Sununu's wins and losses. Eversource gets permission to invest in gas pipelines to supply electricity - NHPR's Annie Ropeik considers ramifications for future efforts to revive Northern Pass. And the town of Hampstead decides to cut back on homework. NHPR's political reporter Lauren Chooljian will be in for her first stint as substitute host. The Northern Pass power line proposal returns before state regulators Thursday. NHPR's Annie Ropeik has more on what a recent court ruling could mean for the project's appeal. The New Hampshire Supreme Court says electric utilities like Eversource should be allowed to invest in natural gas pipelines. Tuesday’s ruling reverses a 2016 order by the state Public Utilities Commission. Opponents of the Northern Pass power project are pushing back on developer Eversource’s request for a new hearing before state regulators. The utility has argued the New Hampshire Site Evaluation Committee didn’t give the embattled power line proposal its due consideration before denying it a building permit earlier this year. They want the SEC to set a new hearing and consider more specific conditions that could green-light the project. Supporters of Eversource’s Northern Pass transmission line want to remove two evaluators from the appeal process for the project’s state permit. A group of business and union stakeholders made the request to the state Site Evaluation Committee this week. The business group wants Public Utilities Commission member Kathryn Bailey and public representative Patricia Weathersby to recuse themselves from future Northern Pass proceedings at the SEC. The Northern Pass project will go back before the state Site Evaluation Committee next month. The panel denied the huge power line proposal in February, and developer Eversource had asked it to reconsider. Now that its written denial of the project is out, the committee has set a hearing on the issue for May 24 in Concord, with an extra day scheduled for June 4 if necessary. There's been lots of talk about voter fraud in New Hampshire elections - we take a look at the reality found in the data behind the rhetoric. Massachusetts drops the Northern Pass bid in favor of a Maine transmission line for a major energy project. We get reaction from local veterans organizations on the firing of Veterans Affairs Secretary David Shulkin. And, hope springs eternal as the the Red Sox open the 2018 baseball season. New Hampshire regulators on Monday put off a final decision on Eversource’s appeal for its Northern Pass permit. The state Site Evaluation Committee, or SEC, voted to wait on next steps until the end of March, when they expect to put their earlier denial of the utility's proposed transmission line in writing. That denial came in early February. Soon after, Eversource asked for the decision to be reconsidered. On Monday, the SEC declined to take up any such request until after their written decision comes out. The New Hampshire Site Evaluation Committee meets Monday to discuss what to do about Eversource's appeal for its Northern Pass permit. The meeting comes weeks after the SEC first rejected the proposed transmission line, which would run nearly 200 miles from Canada to New Hampshire. Eversource's appeal argues that denial didn't give the Northern Pass plan its due consideration. That’s after their initial pick, Northern Pass, hit a major roadblock in New Hampshire – though the transmission proposal still has support from Gov. Chris Sununu. The Commonwealth picked Eversource's Northern Pass plan last month for a long-term contract that must start in 2020. That choice was thrown into limbo a week later, when New Hampshire’s Site Evaluation Committee denied the project its final permit. New England utility markets are still processing Thursday’s rejection of the Northern Pass project application at the New Hampshire Site Evaluation Committee. Eversource’s 192-mile transmission line proposal had just been picked by Massachusetts for a big contract to bring Canadian hydropower to New England. Now that the project has stalled, Massachusetts says only that it's re-evaluating. Its other options include other big, hydro-fueled transmission lines.